Stephan Kaske was 18 years old when he formed the first Mythos line-up in 1969 with Harald Weisse and Thomas Hildebrand. In 1971 they appeared live at a festival and attracted Ralf-Ulrich Kaiser's attention. This led to a contract with Ohr records. The first Mythos album was duly recorded during Autumn 197l. "Mythoett" starts the album in a manner very similar to Jethro Tull. This was a revised version of Handel's fireworks music, on which Kaske played brilliant flute. He would soon be celebrated as one of Germany's best flute players. "Oriental Journey" has an Eastern flavour, as the name implies. "Hero's Death" was, by the Mythos' standards, unusually guitar-dominated. Definitively a poetic way to finish a classic album - one of the best Ohr-releases! Truly indispensable! Late in 1972 the original Mythos split up. Kaske attempted to assemble a new trio at the beginning of 1973, but this came to nothing. Then in December 1973 he teamed up with Robby Luizaga and Hans-Jurgen Putz for the production of a television soundtrack for "Die Superspinne". One of the tracks was later to be found on Dreamlab (1975), entitled "Eternity". 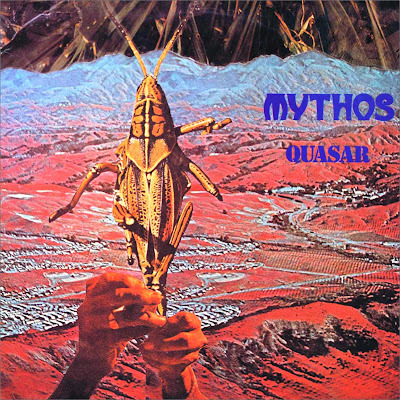 This album, Mythos' second one, was released on Ohr's logical successor: Kosmische Musik. It was another great work of a more cosmic and spacey nature. However, Kaske himself thought of Dreamlab as a 'B-work' more than all ordinary Mythos album - pre-ordered by label manager Ralf-Ulrich Kaiser. The album cover was also Kaiser's decision: drawings of Tarot cards by Peter Geitner. Kaske soon separated from the two studio musicians he had worked with previously and produced further soundtrack works. In the Summer of 1976 he formed the third Mythos line-up with: Sven Dohrow, Eberhard Seidler and Ronnie Schreinzer. This was indeed a changed Mythos concept, now concentrating on shorter, more commercial and rock-based songs.